Theertham : Brahmma, Kamadenu, Chandra, Agni, Kamadenu theertham is now called as Thena theertham. The place is praised in Thevaram hymns of Gnanasambandar: “Let my tongue ever sing the glory of the Lord of Avur Pasupatheeswaram, known for its fertile plantain fields entertaining the monkeys living around, wearing the sacred ash, standing majestically with His long hair, acknowledging the worship of Lord Vishnu and ever present in the minds of devotees.” This is the 21st temple on the southern banks of Cauvery, praised in Thevaram hyms. 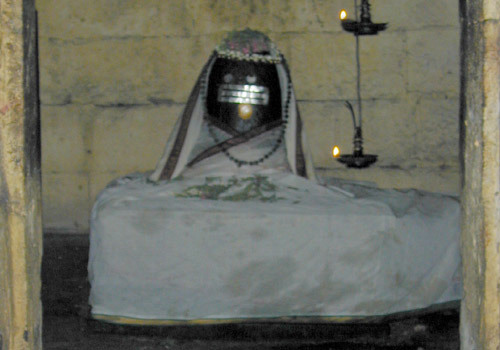 Shivarathri in Vaikasi (May-June), Annabishekam in Iypasi (October-November) and Thiruvadhirai in Margazhi (December-January). 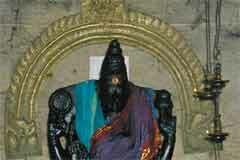 Presiding deity Lord Pasupatheeswarar is Swayambu in Linga form. 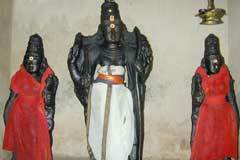 There are five Bhairavars in standing form worshipping Lord Shiva. Hence the place is called Pancha Bhairava Thalam. Lord Muruga in the temple graces with a bow in hand. Sri Pasupatheeswarar Temple, Avur Post, Via Kumbakonam, Valangaiman Taluk, Thanjavur district – 612 701. Blessed by the Lord responding to their prayers, devotees perform abishek and offer Vastras (clothing) and also do feeding (Annadhanam). Lord Brahmma, seven sages (saptha rishis), Ganas (attendants of Lord Shiva), Devas, Iyakkas, Gandharvas (all belonging to the celestial world), Indira the King of Devas, Sun, the nine planets (navagrahas), Lord Vishnu, Emperor Dasaratha worshipped Lord Shiva in this shrine and got blessed. A king, Darmadhwaja by name had a dip in the holy spring Brahmma theertham and was cured of his leprosy. Lord Muruga graces in the temple with a bow in His hand. Avur is the birth place of eminent Tamil poets as Avurkizhar, Avur Moolankizhar and Perunthalai Chathanar. The celebrated Tamil Epic Manimekalai forming part of the five ancient Tamil epics, praised as Aimperum Kappiangal, was authored by Chathanar. Divine cow Kamadenu visited the shrine to get relief from the curse of Sage Vasishta. Cow is known as GO in Sanskrit. As the cow came to this place, this is also known as Govandhakudi (palace where the GO came). 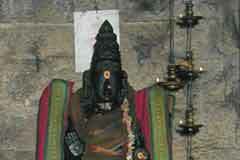 The abishek performed by Kamadenu is depicted in the flag post of the temple. 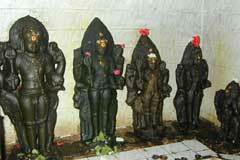 Manikudam and Aswathavanam are the other names of the place. Of the two stones brought by Vayudeva in a competition with Adisesha, one is here while the other is at Nallur, according to scriptures. 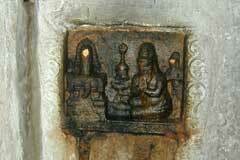 The presiding deity is a Swayambu Linga. 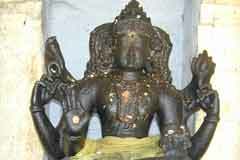 The temple 15 km from Kumbakonam can be reached via Patteeswaram. Bus facility is available from Kumbakonam. Hotel Lion City, phone +91-4362-275 650,275 926-7.